Discussion in 'Missing 2010 to 2014' started by ~Lyric~, Jul 13, 2015. Below, Chloie and Gage with their grand parents, who died in a fire. Chloie and Gage's remains were never found. A Middle Tennessee AMBER Alert has been issued for the Bedford County Sheriff's Office for 9-year old Chloie Leverette and 7-year old Gage Daniel. The children were last seen on Sunday, September 23, 2012 at approximately 6:30 p.m. by a neighbor. Chloie and Gage lived with their grandparents at 730 Kingdom Road, Unionville, Tennessee. That home was destroyed by fire on Sunday night at approximately 9:30 p.m. After an extensive five day search, multiple fire experts have processed the scene and are unable to locate evidence that Chloie and Gage were victims of the fire. The location of Chloie and Gage are unknown at this time. If you have any information concerning the children, please contact the TBI at 1-800-TBI-FIND (1-800-824-3463). Uno2Much, spike, SheWhoMustNotBeNamed and 1 other person like this. The fire was intense and quickly collapsed the walls of the Tennessee farmhouse. Firefighters spent several hours battling the flames at the house that sat far back from the road and not near a fire hydrant, but they were unable to save the elderly couple who lived there. 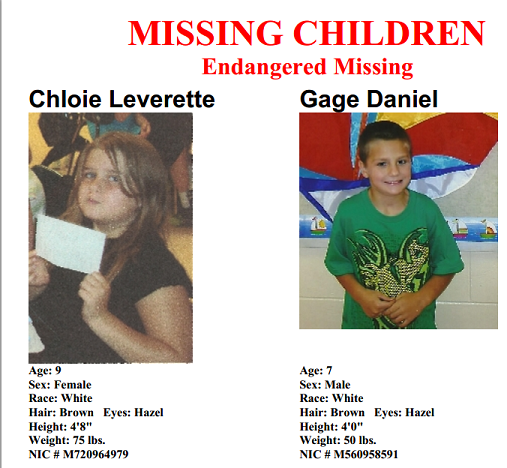 The Tennessee Bureau of Investigation on Wednesday issued an endangered child alert for the children, 9-year-old Chloie Leverette and 7-year-old Gage Daniel. TBI spokeswoman Kristin Helm said the agency issued the alert "under an abundance of caution." "As time moves on, we don't want to miss our opportunity to locate them if they were not in the house," Helm said. The two children were initially believed to have perished in the intense fire, which firefighters battled overnight Sunday and early Monday. The State Fire Marshal's Office said in a statement that it has concluded "that there are no remains of the two children in the structure. The children's location at this time is unknown." Its investigators will determine a cause. Forensic anthropologists and cadaver dogs searched through the rubble for the remaining bodies and the Tennessee Highway Patrol used a helicopter to search the surrounding area. Even in an intense fire, some bones and teeth should remain, although finding them may be extremely difficult, said Dr. William Bass, who founded the Body Farm research center at the University of Tennessee in Knoxville, where researchers study the decomposition of corpses in a variety of circumstances to aid scientific and criminal research. "When you cremate a body in a crematorium, and it is cooling down, when you open the door, you can still identify the bones even if they are children," he said. A child's skeleton contains many more bones than an adult skeleton, and bones and teeth shrink in size when exposed to fire, so the bones that the investigators are looking for could be only a couple of inches long, he said. The state Department of Children's Services investigated the mother of the two children and Daniel's father between 2006 and 2010, said spokesman Brandon Gee. Gee would not release the names of the parents. He would not say why the parents were investigated, but said the agency was sharing information with law-enforcement officers involved in their search. He confirmed that the McClarans had custody of the two children, but he said DCS has never taken custody of them nor placed them in a home. Uno2Much, spike and SheWhoMustNotBeNamed like this. UPDATE: 7/5/13 - Sheriff Boyce talked about what may have happened to missing Chloie and Gage to News Channel 5. Boyce said the floor of the home collapsed in the blaze, sending the grandparents and possibly the children into the basement. "They were in a pit. (It was) a fire pit at that point," said Boyce. It is possible the temperature got to 1,600 degrees which the temperature of heat used in a crematorium. He also explained that the children's bedroom was above a storage closet holding more than 30 propane tanks collected by the grandfather. The thought is that the emergency valves opened during the fire causing an explosion. "Does this type of thing stay with you? You bet. I think about it almost every day," said Boyce, who said he hopes he's wrong about the children dying in the fire. He said he will never stop looking for them. Uno2Much, spike, Looking4you and 1 other person like this. My gut has always told me that these kids are alive. And I totally trust Dr. Bass's opinions - he's the best. But, it certainly seems there would have been some sort of sighting over the years...but maybe there have been tips we are unaware of. spike and Kimster like this. 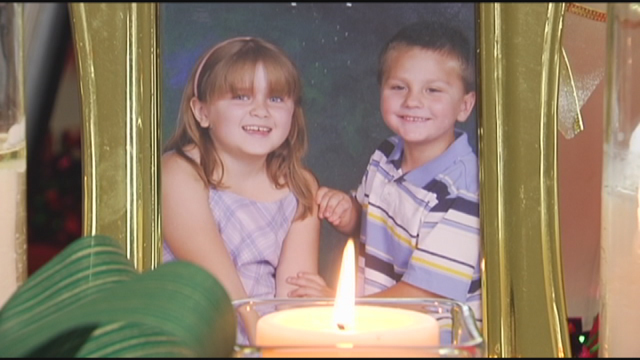 It’s been four years since a brother and sister disappeared after a deadly house fire in Bedford County. Initially investigators thought the then 9-year-old and 7-year-old were also killed, but physical evidence of the children was never found. An AMBER Alert was later issued but the children have not been seen since before the fire. Anyone with information is urged to call the Tennessee Bureau of Investigation at 1-800-TBI-FIND. Christopher Daniel knows exactly what the family of 15-year-old Elizabeth Thomas is going through. He's been living the same horror for nearly five years. The 54-year-old Shelbyville, Tenn., man's son and stepdaughter are among four missing children at the center of three active Amber Alerts in the state. They're also among 74 children reported missing in Tennessee, state records show. Gage Daniel and Chloie Leverette vanished the night of Sept. 23, 2012, after a fire destroyed their grandparents' Unionville home — less than 30 miles east of Columbia, Tenn., where Thomas disappeared just over two weeks ago. After the fire, remains of the children's grandparents were identified by forensic scientists. But after a long list of law enforcement agencies found no trace of the children, ages 7 and 9 then, they were classified as missing. "It's just the same thing over and over and over again," Daniel said as a multistate manhunt remained in effect Wednesday for Thomas and her 50-year-old teacher Tad Cummins, wanted on an aggravated kidnapping charge in connection with her disappearance. "It never gets any better. I wish I knew what to do, but it's been five years. I feel for her family. For their pain." Kimster and spike like this. Right now in Bedford County alone, there are three missing person cases being investigated by the TBI. Two of those cases involve brother and sister Chloe Leverette and Gage Daniel, who were with their grandparents. Their grandparents died in a house fire, but the children’s bodies were never found in the home. Over the years, there have been numerous vigils for Bedford County missing persons including for Chloe and Gage. If you have any information on any missing persons cases call 1-800-TBI-FIND. Uno2Much, Kimster and Paradise like this. More than five years after a house fire in Bedford County prompted a search for two missing siblings, a social media group is working to garner new leads in the case. The Facebook group "Missing in Middle Tennessee - Cold Cases" posted Monday night about the case, showing age-progressed photos of Chloie and Gage and providing the latest details on the investigation. Members of the group are urging anyone with information in the case to contact the Tennessee Bureau of Investigation at 1-800-TBI-FIND. This Sunday marked the anniversary of a house fire that began a mystery for one Middle Tennessee family. "They did find my mom, they found my dad, they found a cockatoo bird and a poodle. I feel like if they was going to find those bones, they would've found something of one of my children, but nothing ever showed up," said Cheryl Daniel, the mother of the children. Some believe the children's remains were turned to ashes in the fire, but back in 2016 investigators told News 2's Jessica Jaglois - that there was no way that could be true. "We were not able to find any remains in the house fire that belonged to the children, so now we wonder, where are these children?" said Dr. Mike Tabor, Chief Odontologist for the state Medical Examiner's Office. The family added that they communicate with the TBI, regularly, about the case; saying they will never give up looking for Chloie and Gage. If you have any information that can help investigators, you're urged to contact the TBI at 1-800-TBI-FIND.